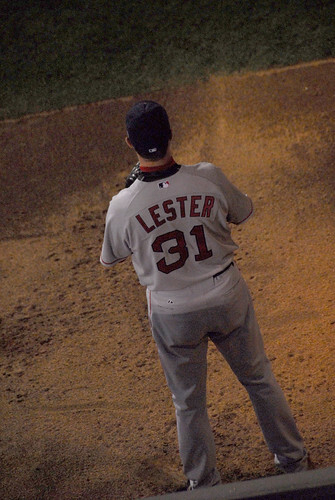 Lester in the Pen, originally uploaded by Eric Kilby. Running late, as usual. Blame the Red Sox this time. What would you have me do: watch the Sox/Yankees or crank out the ICYHBKUWCE that I owe you? In the meantime, I’m not going to say anything about our play of late so as not to jinx us. But given that there’s another tilt with the empire coming in a littler over an hour, I’m going to keep this short and sweet. This week’s edition of In Case You Haven’t Been Keeping Up With Current Events is player focused. Enjoy, or at least read it. Heard anyone complaining about his defense, and/or the impact it’s having on Timmeh? Me neither. The Sox should, of course, be actively on the market for catching because one injury to Tek and we’re in serious trouble (Brown and Kottaras’ success notwithstanding – more on that in a follow up). We could, in fact, find ourselves in a similar position to the Empire. It’s not exactly throwing heat, but Colon – sidelined by an oblique injury – is at least back to playing catch. Cora, on the other hand, was DL’d with Thurston replacing him. If Lowell wasn’t already out, I’d be less concerned about this, as it would offer Lowrie an opportunity to get his feet wet in an uber-utility role. Yes, his inconsistency is driving me crazy too. This past weekend, he gets couple of big outs against the Yankees. Last night? 2 free passes in an inning, and one hit by pitch scoring the at-the-time tying run. How a pitcher with his stuff gets into so many 3 ball counts is beyond me, but until his command is better he won’t be the relief ace that we want him to be. Anyone else think it was interesting to see him replaced by Aardsma last night – particularly given their similarity? So far this season, Lester has thrown one outstanding start against weak hitting Oakland, one below average start against Detroit and two bad starts in Japan vs. the A’s and Monday at Cleveland. Lester isn’t being consistently pounded for home runs and hits (just two big ones- Emil Brown and Marcus Thames), but he’s constantly falling behind in the count, throwing all over the zone and putting too many free runners on base. Remember when I asked whether his Oakland start was an adjustment or mere statistical variation? Well, we may not know the answer yet, but the initial data isn’t promising. It’s so unpromising, in fact, that Hayes asks whether or not it might be Lester rather than Buchholz that’s sent down when/if Colon arrives. My own take is that Buchholz will be headed back down, unless Lester completely and utterly melts down, for the simple reason of innings. Buchholz’ professional innings totals? 22.2 IP Majors, 285.2 Minors. Lester? 144.1 IP Majors, 483.2 minors. Lester’s far better positioned than Buchholz to handle a full season’s workload at this point, cancer or no cancer. Not much to relate here: the swelling’s down, but there’s been no further progress. Congrats to the rookie for his first appearance, first major league hit, and first major league three RBI game. Particularly since the latter proved the difference in the ballgame. Oh, if you see him, wish him a happy birthday tomorrow. In general, Ortiz hits a lot of foul balls (including two strike fouls!) although he’s a power hitter and power hitters are generally high risk/high reward swingers, hence a lot of K’s and a lot of HR’s. Part of the reason that he’s so good is that his swing allows him to recover from a big swing midway and at least poke a ball foul to stay alive. David Ortiz’s “slump” is nothing more than a run of bad luck. BABIP is generally within control of the hitter and Ortiz, a lifetime .310 BABIP hitter is hitting .114 this year…As much as I’d love it if he would politely hit like this for the next few months (or at least until the Red Sox get out of Cleveland tonight), I wouldn’t bet on that happening unless there’s some sort of (major) injury that we don’t know about. Patience is a virtue. Y’all waited 86 years. Ortiz will be fine. Worth thinking about; I should have looked up his BABIP data myself. Speaking of slumps, remember when everyone wrote him off after Japan/LA? I do. @ahl: missed it. what did he say, exactly?